A Jar of Spring and Summer Wild Flower Honey. The honey we produce is 100% natural, raw and unprocessed. The honey you get in your jar, is exactly how it came out of the hive, all made from wild flowers. Grove Gardens Fruit and Vegetable Shop. Hythe. Beaulieu Motor Museum Gift Shop, Beaulieu. Exbury Gardens Gift Shop. Exbury. Spot in The Woods, Netley Marsh. Braxton Gardens and Tea Rooms. Milford on Sea. If you would like to stock Furzedown Farm Honey please use the contact link below to get in touch. 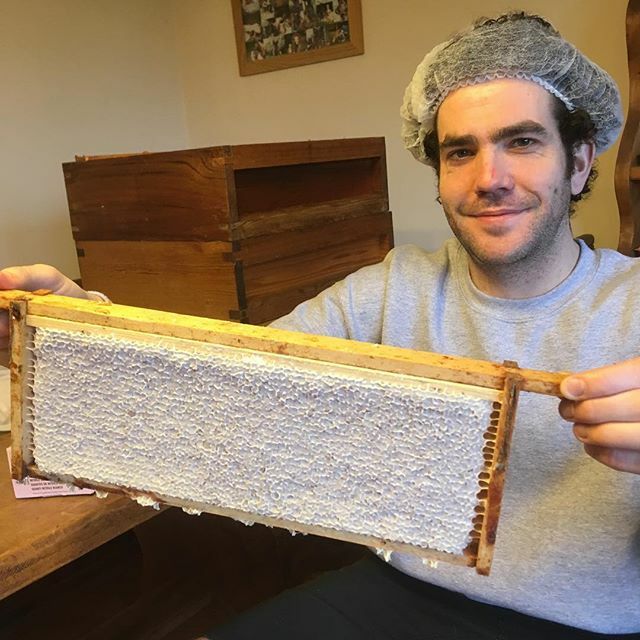 Tom Noble holding a frame of Heather Honey. Doesn't he look nice with his hair net on.